GIMP is capable of reading and writing a large variety of graphics file formats. With the exception of GIMP's native XCF file type, file handling is done by Plugins. Thus, it is relatively easy to extend GIMP to support new file types when the need arises. 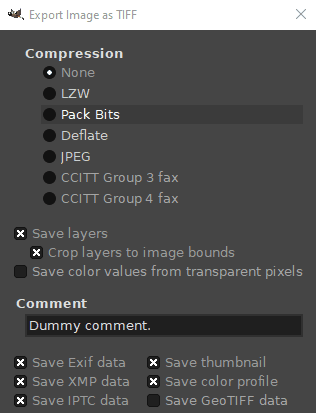 In former GIMP releases, when you loaded an image in some format, let us say JPG or PNG, the image kept its format and was saved in the same format by Save. With GIMP-2.8, images are loaded, imported, in the XCF format as a new project. For example, a “sunflower.png” image will be loaded as “*[sunflower] (imported)-1.0 (indexed color, 1 layer)”. The leading asterisk indicates that this file has been changed. This image will be saved as “sunflower.xcf” by Save. To save this image in a format other than XCF, you must use Export. When you are finished working with an image, you will want to save the results. (In fact, it is often a good idea to save at intermediate stages too: GIMP is a pretty robust program, but we have heard rumors, possibly apocryphal, that it may have been known on rare and mysterious occasions to crash.) Most of the file formats that GIMP can open, can also be used for saving. There is one file format that is special, though: XCF is GIMP's native format, and is useful because it stores everything about an image (well, almost everything; it does not store “undo” information). Thus, the XCF format is especially suitable for saving intermediate results, and for saving images to be re-opened later in GIMP. XCF files are not readable by most other programs that display images, so once you have finished, you will probably also want to export the image in a more widely used format, such as JPEG, PNG, TIFF, etc. There are several commands for saving images. A list, and information on how to use them, can be found in the section covering the File Menu. 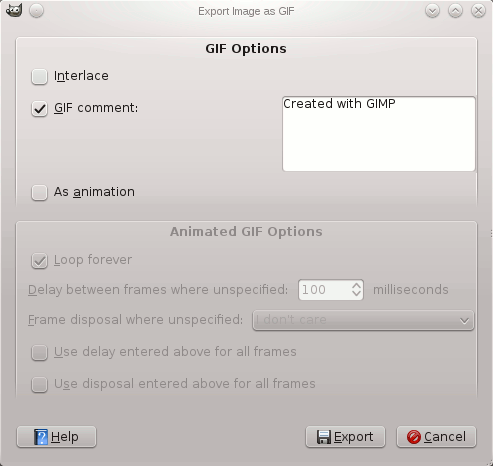 GIMP allows you to export the images you create in a wide variety of formats. It is important to realize that the only format capable of saving all of the information in an image, including layers, transparency, etc., is GIMP's native XCF format. Every other format preserves some image properties and loses others. It is up to you to understand the capabilities of the format you choose. Exporting an image does not modify the image itself, so you do not lose anything by exporting. See Export file. When you close an image (possibly by quitting GIMP), you are warned if the image is "dirty"; that is, if it has been changed without subsequently being saved (an asterisk is in front of the image name). Saving an image in any file format will cause the image to be considered "not dirty", even if the file format does not represent all of the information from the image. The GIF file format does not support some basic image properties such as print resolution. If you care for these properties, use a different file format like PNG. Checking interlace allows an image on a web page to be progressively displayed as it is downloaded. Progressive image display is useful with slow connection speeds, because you can stop an image that is of no interest; interlace is of less use today with our faster connection speeds. GIF comments support only 7-bit ASCII characters. If you use a character outside the 7-bit ASCII set, GIMP will export the image without a comment, and then inform you that the comment was not saved. When this option is checked, the animation will play repeatedly until you stop it. You can set the delay, in milliseconds, between frames if it has not been set before. In this case, you can modify every delay in the Layer Dialog. I don't care: you can use this option if all your layers are opaque. Layers will overwrite what is beneath. Cumulative Layers (combine): previous frames will not be deleted when a new one is displayed. One frame per layer (replace): previous frames will be deleted before displaying a new frame. JPEG files usually have an extension .jpg, .JPG, or .jpeg. It is a very widely used format, because it compresses images very efficiently, while minimizing the loss of image quality. No other format comes close to achieving the same level of compression. It does not, however, support transparency or multiple layers. The JPEG algorithm is quite complex, and involves a bewildering number of options, whose meaning is beyond the scope of this documentation. Unless you are a JPEG expert, the Quality parameter is probably the only one you will need to adjust. When you save a file in JPEG format, a dialog is displayed that allows you to set the Quality level, which ranges from 0 to 100. Values above 95 are generally not useful, though. The default quality of 85 usually produces excellent results, but in many cases it is possible to set the quality substantially lower without noticeably degrading the image. You can test the effect of different quality settings by checking Show Preview in image window in the JPEG dialog. Please note, that the numbers for the JPEG quality level have a different meaning in different applications. 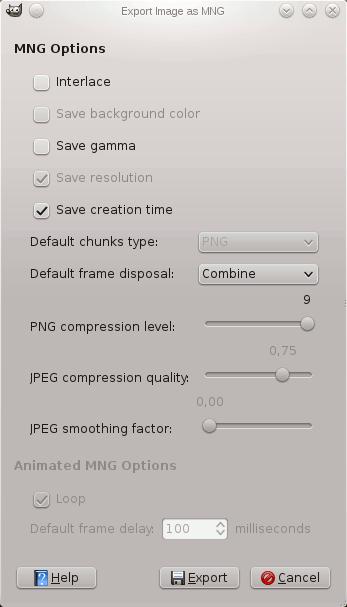 Saving with a quality level of 80 in GIMP is not necessarily comparable with saving with a quality level of 80 in a different application. If you enable this option, the optimization of entropy encoding parameters will be used. The result is typically a smaller file, but it takes more time to generate. With this option enabled, the image chunks are stored in the file in an order that allows progressive image refinement during a slow connection web download. The progressive option for JPG has the same purpose as the interlace option for GIF. Unfortunately, the progressive option produces slightly larger JPG files (than without the progressive option). JPEG files from many digital cameras contain extra information, called EXIF data. EXIF data provides information about the image such as camera make and model, image size, image date, etc. Although GIMP uses the “libexif” library to read and write EXIF data, the library is not automatically packaged with GIMP. 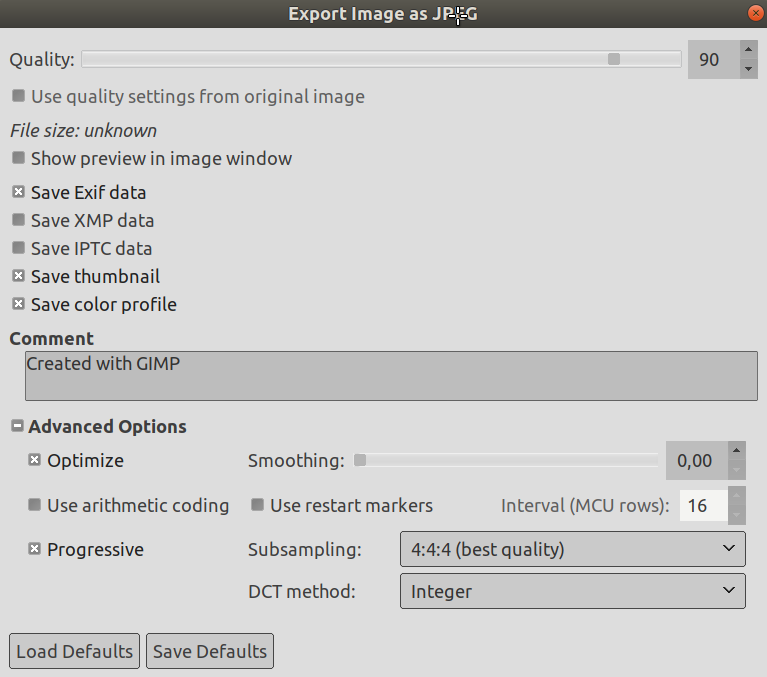 If GIMP was built with libexif support, then EXIF data is preserved if you open a JPEG file, work with the resulting image, and then export it as JPEG. The EXIF data is not altered in any way when you do this. The EXIF data may indicate things such as image creation time and file name, which may no longer be correct. If GIMP was not built with EXIF support, you can still open JPG files containing EXIF data, but the EXIF data is ignored, and will not be saved when the resulting image is later exported. This option lets you save a thumbnail with the image. Many applications use the small thumbnail image as a quickly available small preview image. 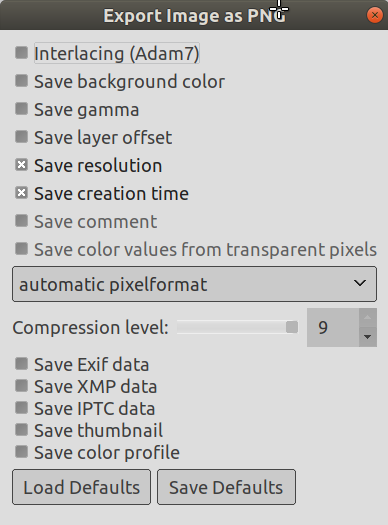 This option is present only if GIMP was built with EXIF support. XMP data is “meta” data about the image; it is a competing format with EXIF. If you enable this option, the meta data of the image is saved in an XMP-structure within the file. If a particular quality setting (or “quantization table”) was attached to the image when it was loaded, then this option allows you to use them instead of the standard ones. If you have only made a few changes to the image, then re-using the same quality setting will give you almost the same quality and file size as the original image. This will minimize the losses caused by the quantization step, compared to what would happen if you used different quality setting. If the quality setting found in the original file are not better than your default quality settings, then the option “Use quality settings from original image” will be available but not enabled. This ensures that you always get at least the minimum quality specified in your defaults. If you did not make major changes to the image and you want to save it using the same quality as the original, then you can do it by enabling this option. JPG compression creates artifacts. By using this option, you can smooth the image when saving, reducing them. But your image becomes somewhat blurred. The image file can include markers which allow the image to be loaded as segments. If a connection is broken while loading the image in a web page, loading can resume from the next marker. 1x1,1x1,1x1 (best quality): Commonly referred to as (4:4:4), this produces the best quality, preserving borders and contrasting colors, but compression is less. 2x1,1x1,1x1 (4:2:2): This is the standard subsampling, which usually provides a good ratio between image quality and file size. There are situations, however, in which using no subsampling (4:4:4) provides a noticeable increase in the image quality; for example, when the image contains fine details such as text over a uniform background, or images with almost-flat colors. 1x2,1x1,1x1 This is similar to (2x1,1x1,1x1), but the chroma sampling is in the horizontal direction rather than the vertical direction; as if someone rotated an image. 2x2,1x1,1x1 (smallest file): Commonly referred to as (4:1:1), this produces the smallest files. This suits images with weak borders but tends to denature colors. DCT is “discrete cosine transform”, and it is the first step in the JPEG algorithm going from the spatial to the frequency domain. The choices are “float”, “integer” (the default), and “fast integer”. float: The float method is very slightly more accurate than the integer method, but is much slower unless your machine has very fast floating-point hardware. Also note that the results of the floating-point method may vary slightly across machines, while the integer methods should give the same results everywhere. integer (the default): This method is faster than “float”, but not as accurate. fast integer: The fast integer method is much less accurate than the other two. In this text box, you can enter a comment which is saved with the image. If your image has many transparency levels, the Internet browsers that recognize only two levels, will use the background color of your Toolbox instead. Internet Explorer up to version 6 did not use this information. Gamma correction is the ability to correct for differences in how computers interpret color values. This saves gamma information in the PNG that reflects the current Gamma factor for your display. Viewers on other computers can then compensate to ensure that the image is not too dark or too bright. PNG supports an offset value called the “oFFs chunk”, which provides position data. Unfortunately, PNG offset support in GIMP is broken, or at least is not compatible with other applications, and has been for a long time. Do not enable offsets, let GIMP flatten the layers before saving, and you will have no problems. Save the image resolution, in ppi (pixels per inch). Date the file was saved. You can read this comment in the Image Properties. When this option is checked, the color values are saved even if the pixels are completely transparent. But this is possible only with a single layer, not with a merged composition. When a multi-layer image gets exported to a single-layer file format, there is no way GIMP could preserve the color values in the transparent pixels. Since compression is not lossy, the only reason to use a compression level less than 9, is if it takes too long to compress a file on a slow computer. Nothing to fear from decompression: it is as quick whatever the compression level. Click to save the current settings. Latter, you can use Load Defaults to load the saved settings. The PNG format supports indexed images. Using fewer colors, therefore, results in a smaller file; this is especially useful for creating web images; see Paragraaf 6.6, “Indexed mode”. Computers work on 8 bits blocks named “Byte”. A byte allows 256 colors. Reducing the number of colors below 256 is not useful: a byte will be used anyway and the file size will not be less. More, this “PNG8” format, like GIF, uses only one bit for transparency; only two transparency levels are possible, transparent or opaque. If you want PNG transparency to be fully displayed by Internet Explorer, you can use the AlphaImageLoader DirectX filter in the code of your Web page. See Microsoft Knowledge Base [MSKB-294714]. Please note, that this is not necessary for InternetExplorer 7 and above. This option allows you to specify the algorithm used to compress the image. None: is fast, and lossless, but the resulting file is very large. LZW: The image is compressed using the “Lempel-Ziv-Welch” algorithm, a lossless compression technique. This is old, but efficient and fast. More information at [WKPD-LZW]. Deflate: is a lossless data compression algorithm that uses a combination of the LZ77 algorithm and Huffman coding. It is also used in Zip, Gzip and PNG file formats. Source: [WKPD-DEFLATE]. JPEG: is a very good compression algorithm but lossy. CCITT Group 3 fax; CCITT Group 4 fax is a black and white format developed to transfer images by FAX. These options can only be selected, if the image is in indexed mode and reduced to two colors. Use Image → Mode → Indexed to convert the image to indexed. Be certain to check “Use black and white (1-bit) palette”. With this option the color values are saved even if the pixels are completely transparent. In this text box, you can enter a comment that is associated with the image. MNG is acronym for “Multiple-Image Network Graphics”. The main problem is that Konqueror is the only Web navigator that recognizes the MNG animation format. Please see http://en.wikipedia.org/wiki/Multiple-image_Network_Graphics.